From the makers of the Genuine Swiss Army Knife, the stylish LEGACY Slimcase is a lightweight and checkpoint friendly for unparalleled convenience when going through airport security. 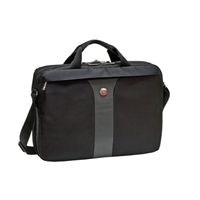 The LEGACY slimcase provides protection for up to a 17" widescreen laptop and an additional compartment for files. Checkpoint-friendly computer compartment. 17.5" x 3.5" x 13.5"